The way this cookie dough smells will knock your socks off. Just wait until you bake them. Mmmmmm. And don’t forget the salt. A good sprinkling right after these come out of the oven is pretty much mandatory, but you can do whatever works best for you. Sea salt and lemon? Well, that’s another fabulous combo. I love how that happens. 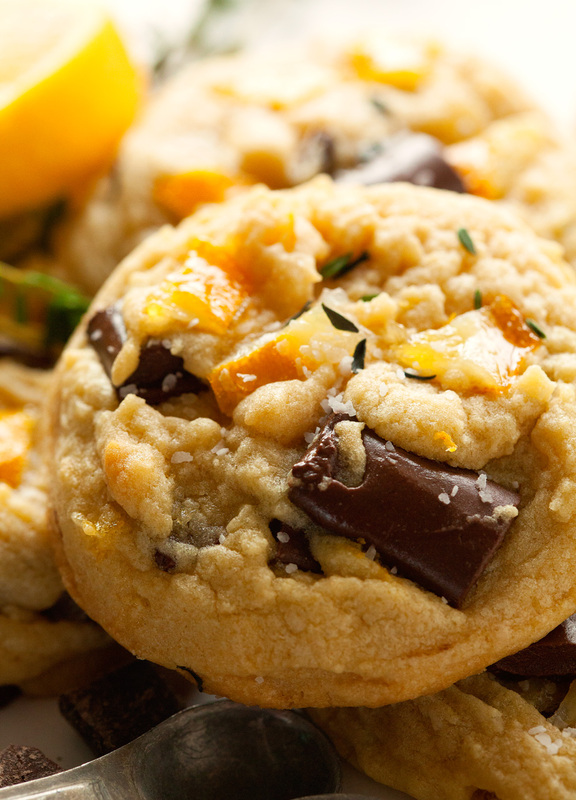 One good thing leads to another and before you know it, you created the cookie of your dreams. At least my dreams, ha! The other thing I always wanted to try was adding a package of vanilla pudding mix to the dough. So in it went. What followed made history in the Deliciously Yum kitchen. Biting into one of these cookies is like biting into a cloud. Or what I imagine that would taste like. So pillowy, soft and chewy. It’s amazing. I am pretty sure we will be stockpiling vanilla pudding mix packages in our pantry from now on. Can’t believe it’s taken me this long to jump on the pudding train. Let’s just savor the moment, shall we?! You should also know that this cookie dough doesn’t require any refrigeration. There is a time and place for chilling your dough, but it’s absolutely not necessary for this one. Quick, easy, and utterly delicious. Like I needed one more reason to love this recipe, lol. Alright, friends. Hope you give these cookies a try – the perfect way to celebrate the first day of Spring, which is less than 24 hours away. Woohoo! 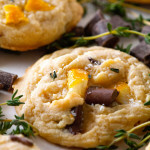 These cookies pack some serious lemon flavor complemented by fresh thyme and lots of melted chocolate. The sea salt sprinkled on top pulls it all together. One of the chewiest and most delightful cookies I have ever had. 1. Start by making the candied Meyer lemons. Combine sugar and water in a skillet and bring to a boil. Meanwhile, cut 2 lemons into 1/4-inch slices and place into the boiling sugar water (make sure sugar is completely dissolved).Turn heat down and let simmer for 30 minutes or until lemons are translucent (cover with the lid or a piece of parchment paper). Remove skillet from the stove and let the slices cool completely in the syrup. Transfer lemon slices from the skillet to a wire rack (you may want to place a paper towel underneath the wire rack to catch any drippings) and let dry completely. I ended up placing the wire rack in a 250 degree oven for 20 minutes to speed up the drying process. If you choose to do that as well, keep an eye on the slices to prevent them from burning or getting brown. 2. Once the slices are close to being dry, line a baking sheet with parchment paper and set aside. Prepare the cookie dough in your stand mixer. Cream together butter, shortening, brown sugar and granulated sugar. Add pudding mix and combine. Next, add both of the eggs and vanilla extract. Once incorporated, add baking soda and salt. Slowly add flour and stir until well combined. 3. Remove bowl from the mixer and stir in chocolate chunks. Add zest of one lemon and fresh thyme leaves. 4. Remove Meyer lemon slices from the oven and turn to 350 degrees F. Cut candied lemon slices into chunks and gently incorporate into the dough. Scoop 2-3 tablespoons of dough per cookie onto the prepared baking sheet. Place into the oven and bake for 10-12 minutes or until cookies are slightly brown on the edges. Remove and sprinkle with sea salt, if desired. Let cool for a couple of minutes before transferring to a wire rack to finish cooling completely. Repeat with remaining cookies. Enjoy! Cookies will keep up to 1 week stored in an airtight container or up to 2 months in the freezer. Oh my goodness these cookies are divine. I recently did a lemon and thyme combo with other citrus and dessert too, but I love this combo with the addition of chocolate. Yummy! Ha, it certainly was. I hope you enjoy them – they are so delicious. Thank you so much for your sweet comment, Kelly! These are the most beautiful cookies I have ever seen! What a great combo of flavors! Thank you so much, Sam! Hope you love them as much as we did! Holy moly do the flavors in this sound amazing! I can picture myself serving this along with a big pot of tea in the afternoon and pretending I’m a fancy lady. Haha, that’s exactly what I thought – these cookies look a little gourmet and I am not that fancy at all :). But hey, there’s nothing wrong with pretending once in a while, huh?! Thank you, Natalie! I’m dying over this flavor combination! This recipe is sure to help out in my current obsession with all things citrus! Pinned! I am suffering from the same thing, lol. Going a little crazy with citrus lately and I absolutely love it :). These look delicious- you can’t beat a good cookie! Kathi, these cookies look so good! What an interesting idea, but it looks like it definitely works! 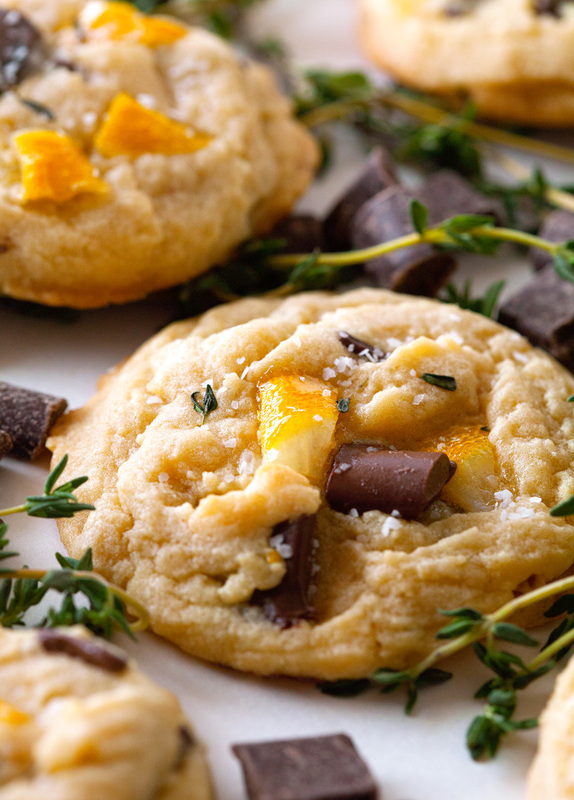 I have never used herbs in cookies, but I love the idea! Pinning! I had no idea what herbs in cookies would taste like, but it works like a charm. You should definitely try it sometime. Thank you!! 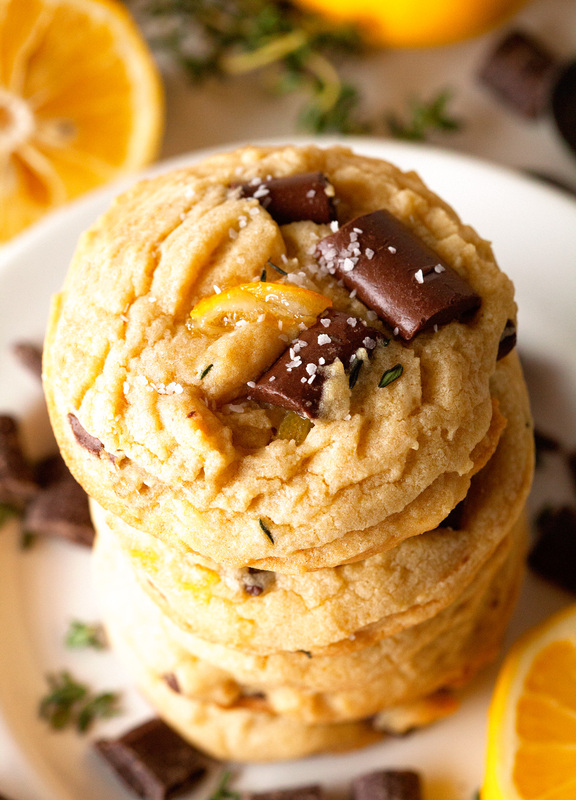 I love this springy twist on a chocolate chip cookie!!! You are so brave for adding thyme now I have to try it!!! Thanks, Karen! I love trying out new things and it only gets better when they work out well :). 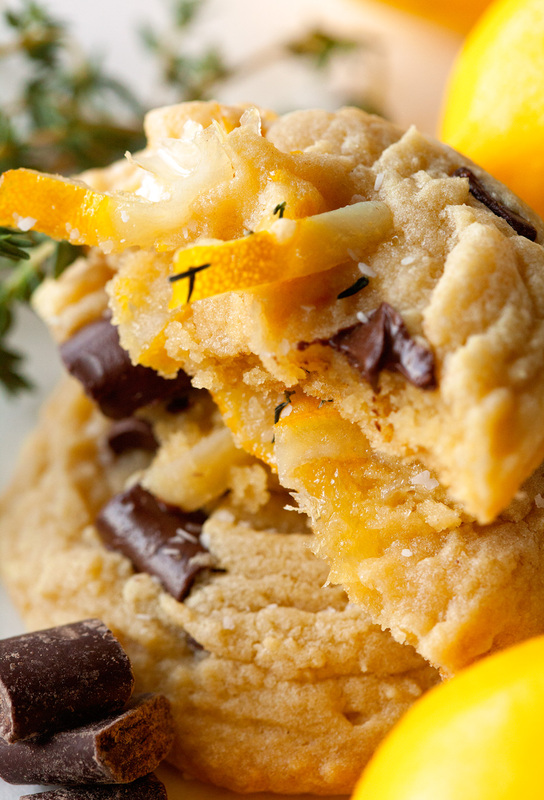 You will love it – herbs in cookies are ah-mazing! Wow! All of my favorite things in one cookie!!! I can’t wait to try these. Pinning! This was one of my crazy cookie ideas and unlike some others, these turned out really well, ha. Let me know how you like them if you give them a try :). Thank you, Jenn!! Thank you so much for the love, Elizabeth!! So glad you love these as much as I do :)). 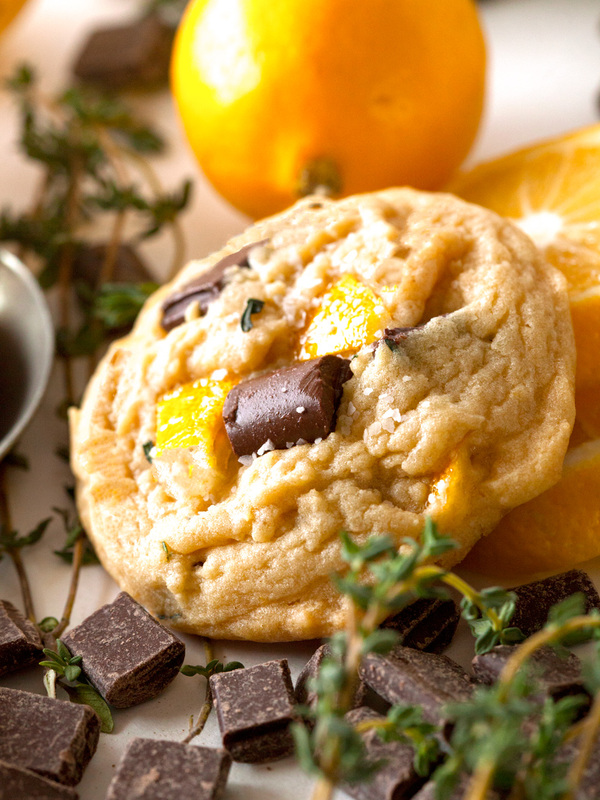 What an incredible combination of flavors – I would never have thought of combining lemon, chocolate and thyme in a cookie and topping it with salt! Brilliant! Thank you, Shashi! These flavors are so good together. Hope you get to make them sometime. I have wanted to try using fresh herbs in cookies for so long now!! I love the sound of the thyme / lemon combo! You should definitely try it, Ashley. Herbs in cookies are so good – I was pleasantly surprised! 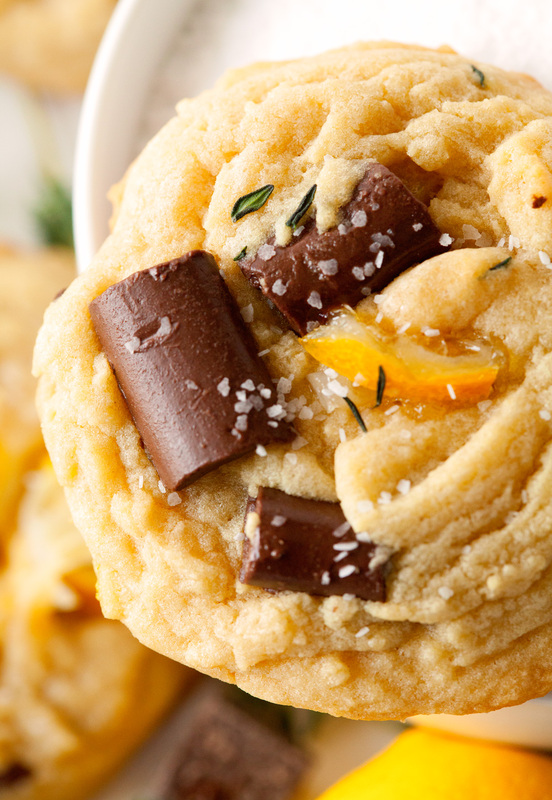 Chocolate and candied oranges in cookies? I need these in my life ASAP! What a great flavor combo Kathi!! I love the flavour combination! 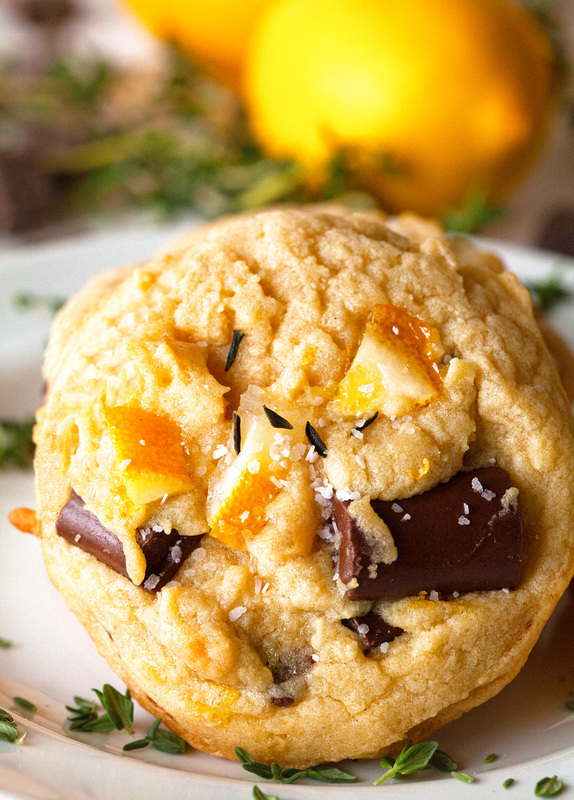 Candied lemons and chocolate seem to complement each other so well; perfect or those chocolate chip cookies! They definitely do. Thank you so much, Jessica! Kathi, I’m kinda obsessing over these cookies! I love the idea of using herbs in cookies, but I’ve never done it. You have me convinced! Also, I can’t get over the color contrast of the candied lemon and the chocolate chunks. Hello, beautiful! Awww, your comments always make me smile, Ashley. Thank you so much – and yes, you should try adding herbs to your cookies. You will be surprised how well it works!